It isn’t often that a director can so effortless create an alternate universe where the rules of our waking world no longer correspond to the one we’re seeing projected. Co-writer/director Miki, however, has done just that with his passion project rife with sexual imagery, exotic lifeforms and floating pyramids with corresponding orbiting spheres. 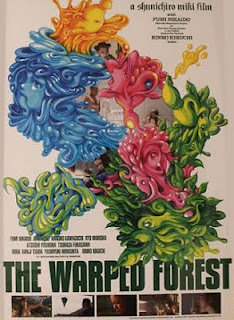 Interpretations of the film’s underlying intentions could fill several books, but it also succeeds as a work of pure fancy where odd creatures wander the landscape, people one-sixth the size of “normal” humans occupy the same world without comment, and all sexual energies are directed to the consuming of suggestively shaped fruit. A major work from the co-director of 2005’s The Funky Forest.